The Drum, March 19, 2018: Lessons from International Women’s Day: when is it ok to get involved as a brand? How do we, as consumers and marketers, measure up a femvertising campaign against this spectrum? If mostly “no’s” – This company is paying lip service to feminism. This is “faux-feminism” and a gimmicky marketing campaign meant to cash in on the women’s rights movement by earning free press. 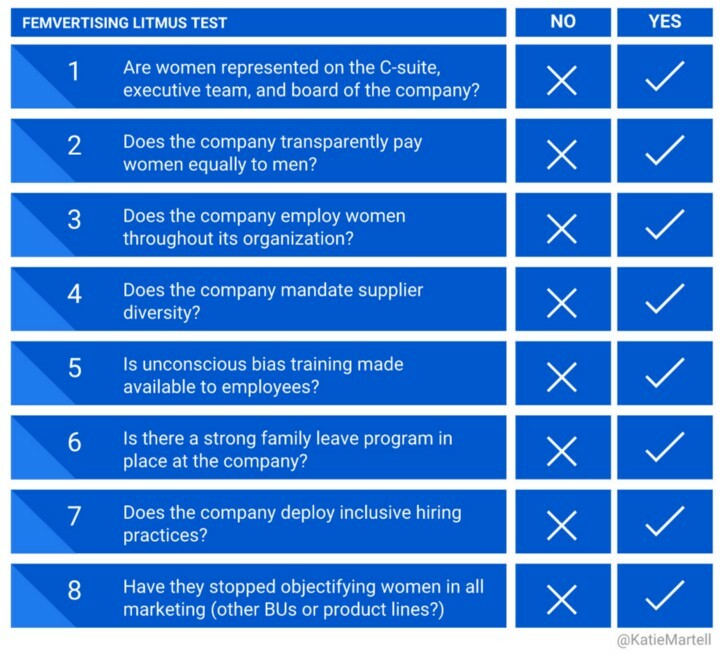 If you’re evaluating your own firm against this checklist, and reach mostly “no,” it’s likely best to pursue another narrative in your campaign. If mostly’s “yes’s” – Fist bumps all around. This is a champion of women’s rights, a company putting their money where their mouth is and creating real change in the world through their actions. They deserve to be celebrated for using femvertising to grow their brand equity and awareness.